This selection comes to us from the Italian organist Maurizio Croci and his recently formed Il Pegaso, an impressively international group of musicians based in Fribourg and specializing in early Italian Baroque music (the name is Italian for Pegasus). Recorded in what appears to be a chilly Swiss basilica (the production photos show the performers wearing thick sweaters), the album purports to feature "newly discovered pieces by Monteverdi and Frescobaldi", but this is a bit deceptive. The works in Tracks 1, 3 and 19 have been known for a while, but were only attributed to Monteverdi in 2011. As for Frescobaldi, what's presented in Tracks 4, 12, 13, 16 and 18 are early versions, possibly sketches, of established instrumental pieces, taken from a notebook recently discovered at the Bibliothèque nationale de France. The album is filled out by several other, long-established pieces by the two composers, capped off by an anonymous Romanesca and an attractive theorbo piece by one Bellerofonte Castaldi. 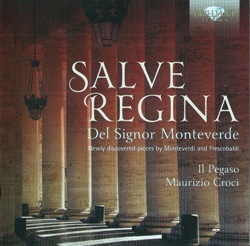 Notwithstanding the "newly discovered" moniker, the real concept of this album is the alternation between Monteverdi Salve Regina settings and Frescobaldi instrumental works. It's an intriguing juxtaposition of works by these two most famous Italian composers of the early 1600s. The Frescobaldi compositions are more bound to the past, displaying the elegant late Renaissance instrumental counterpoint where each line is given roughly equal weight, and entrances are sequential and imitative. The Second Ricercar (Track 14) is typical. Note the second, inverted, entry of the subject. Played on an organ, with its traditional religious associations, it sounds sacred, and indeed Frescobaldi's ricercars (and toccatas, canzonas and versets) were written to be played at specific points during a church service. Il Pegaso uses a theorbo (sometimes with organ added) as the continuo instrument on the vocal tracks, reflecting the current emphasis on lute-type instruments for this role (a welcome contrast to the stereotypical harpsichord inevitably used in older recordings of this music). One disappointment is the liner notes, which do not include texts and which say little about the compositions themselves. Another quibble might be the somewhat narrow timbral range of the ensemble: three male voices, organ and theorbo. But the Frescobaldi + Monteverdi pairing is well-conceived, making this inexpensive album a worthwhile and unique addition to the library of anyone interested in early Baroque music. Original Material and HTML Coding Copyright © 2015–18 by Michael Schell. All Rights Reserved.